I am sure this is an experience everybody has had at some time. For years you hear a book praised to the skies, but for whatever reason you never get around to reading it. Finally, you settle down and read it. And you are severely disappointed. It has simply failed to live up to all the praise you had heard heaped upon it. With a sigh, you reflect that you might have enjoyed it more if you had never heard it so often praised. I feared that this would happen to me with regard to Richard Hughes’ A High Wind in Jamaica. I had heard of it and I had a vague idea of what it was about. As a teenager I saw what turned out to be a rather unsatisfactory movie based upon it. But I had never read it. So, only very recently, I sat down and read it. And – miraculo! – it proved to be every bit as good as people had said it would be. It is a rich, mysterious, wonderful, troubling and exquisitely written novel. I closed it with the distinct impression that it was a masterpiece. The jinx was broken. Prior praise had not damaged my appreciation of a great novel. Some background, as is my wont. 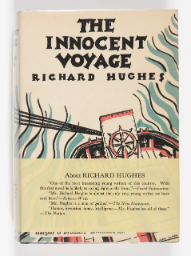 Richard Hughes (1900-1976), English-born but Welsh by adoption, was one of those novelists who produce very little but who are greatly appreciated by connoisseurs. In half a century of work, he wrote just four novels. 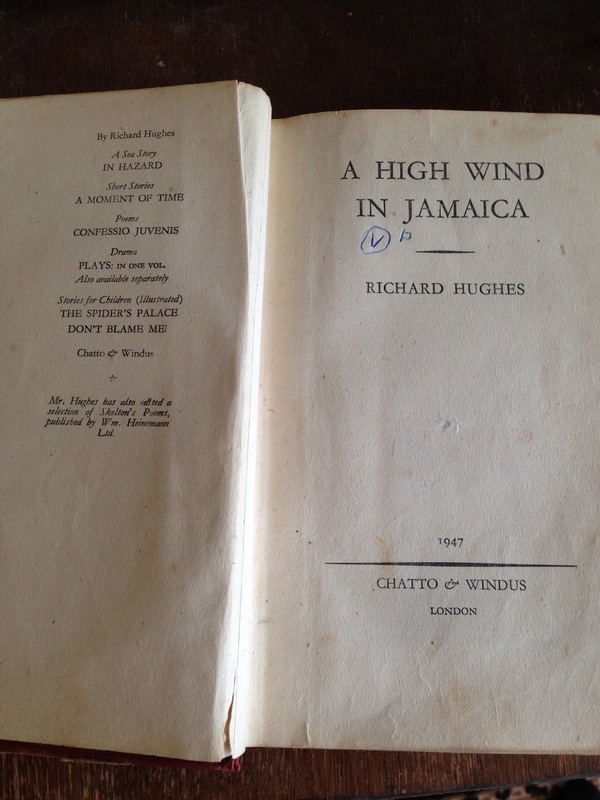 One of them, A High Wind in Jamaica, written when he was 27, is considered his greatest work. Another, The Fox in the Attic, written over thirty years later, was also highly praised. I read The Fox in the Attic many years back - it was intended as the first part of an historical trilogy, which Hughes never finished. It is set in interwar Germany, and it contains the best fictional portrait of Hitler (as a young fanatic) that I have yet met – certainly better than A.N. Wilson’s footling attempt to fictionalise Hitler in his Winnie and Wolf. 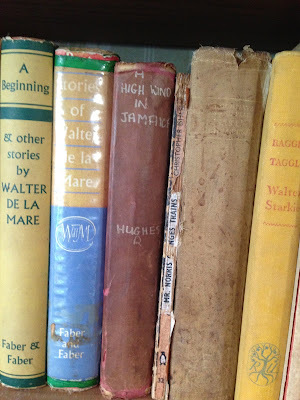 Hughes’ other two novels, which I haven’t read, are admired but don’t have such a high reputation. Historical commentary and black humour aside, the most noticeable thing about the narrative voice is its selectivity. The third-person voice scarcely ever lets us see what is going on inside the minds of the adult characters, but it tells us in detail what (a selection of) the children think. And here, in the steady drumbeat of subtext, is what the novel is really getting at. The children may in some sense be innocent – they do not notice things which are apparent to adult readers – but they are not innocent, pure and moral. They are innocent, self-centred and completely amoral; and as such they are very dangerous creatures. Sometimes they yelp with laughter at things which are frankly sadistic or dangerous to others, simply because they seem part of a show put on for their amusement. All this has much bearing on the way the story develops, which I will refrain from relating in detail. Suffice it to say that it involves a brutal murder, in which a child is involved, and a denouement back in England where moral responsibility for a great injustice sways between a knowing adult and a child who knows more than adults suspect. A High Wind in Jamaica has often been compared with William Golding’s Lord of the Flies, which was published 25 years later in 1954. I can see that they have some things in common. Both take traditional boys’ adventure-story situations (captured by pirates here; stranded on desert island there) and turn them upside down. Both show children behaving in ways that completely contradict notions of innate childhood innocence and gentleness. 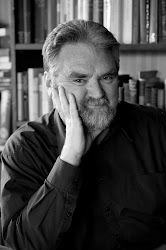 However, while I would not presume to judge one of these obviously great novels as being “better” than the other, I would say that Golding’s novel is more consciously a poised and patterned allegory, with each of his characters representing an aspect of (male) human nature threatening a reversion to barbarism - domineering Jack, sadistic Roger, rational Piggy, saintly, visionary Simon and average, questing Ralph. A High Wind in Jamaica has no such neat scheme. Further, while Golding is clearly concerned with the provenance of Evil – or Original Sin – Hughes is not seeing children as evil so much as callous, indifferent, not caring, and not having yet learnt civilised values. The two most shocking things in A High Wind in Jamaica are not things the children do, but things the children simply do not notice. One of the children (I won’t spoil the plot by saying which) dies. So absorbed are they in their own games and adventuring and feeding that the other children don’t even notice the child’s disappearance until much, much later, and then they have to be told by an adult. 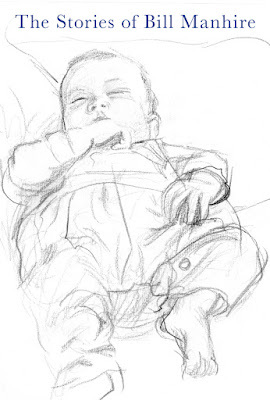 (In the edition I read there are eighty pages between the child’s death and the next mention of the child). Similarly, the perceptual innocence of children means they misread the world and miss things. The narration gives us many hints that there is a looming threat of the pirates sexually abusing their young captives. It is partly signalled by the strange scene in which pirates dress in drag to capture a merchant ship. (Now what do those pirates usually do with those women’s clothing?) The children know none of this and therefore never understand why pubescent 13-year-old Margaret Fernandez disappears among the pirates for long stretches and returns dazed, confused and incapable of saying what has happened to her. Note here, by the way, that A High Wind in Jamaica does not perform any such foolish manoeuvre as assuming that if children are blameworthy, then adults must be blameless. It is just that the blame adhering to children is of a different sort. I could say many more things about this great novel’s wider philosophical resonance. Of course it is (as Lord of the Flies is) a rebuke to the sort of Lockean empiricism which says a child’s mind is a mere tabula rasa waiting for the writing of experience. 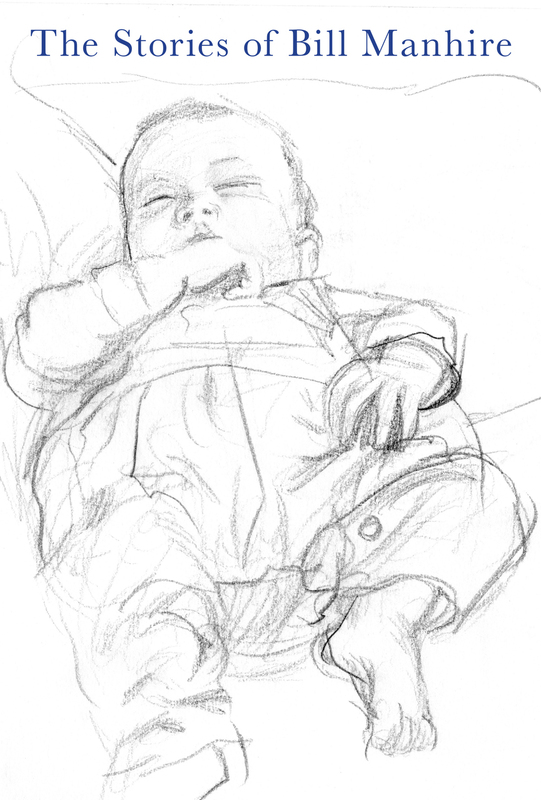 A child’s mind is a very complex thing, and carries much into the world before outer, worldly experience begins. I could note when the novel was written – after the First World War, and therefore after a major puncturing of the notion of rational moral “progress”; so Victorianism was being rebelled against. In the 1920s, Victorianism could be rejected in the sneering (and extremely snobbish) Bloomsbury terms of Lytton Strachey, where Victorians were seen as simply jumped-up inferior people; or it could be rejected as Richard Hughes rejects it, by showing how Victorian narratives often disguised radical flaws of the human soul. Indeed I could say many other equally clever things about the novel’s ideas. But I end where I began – this is a great novel and it is a great novel for the same reason that all great novels are great – because it is so well written. Footnote about that “rather unsatisfactory movie” I mentioned earlier: In 1965, A High Wind in Jamaica was turned into a Hollywood film directed by the American-born Scottish director Alexander Mackendrick. Mackendrick was the very talented director of some of the best of the Ealing comedies – Whisky Galore, The Man in the White Suit, The Maggie and The Ladykillers. He went to America and directed his film masterpiece, a scathing satire of the public relations industry The Sweet Smell of Success, in which Burt Lancaster and Tony Curtis give their best-ever performances. Mackendrick had long wanted to film A High Wind in Jamaica. By a coincidence, he knew the novelist Richard Hughes, who had worked as a scriptwriter for Ealing studios (but apparently not for any of the films Mackendrick directed). But things went badly wrong with the film. To begin with, it was clear that the Hollywood studio expected exactly the sort of family adventure film that the novel was definitely not. 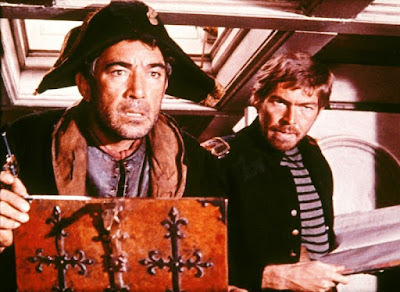 To go on with, for American box-office appeal, Mackendrick was given Anthony Quinn and James Coburn to play the pirate captain and his mate. Both of them were very good movie actors (I’m not knocking them) but their screen personae were far from the rumpty incompetent pirate captain Jonsen and his dodgy mate Otto in the novel. In fact, they were both more like traditional Hollywood yo-he-ho swashbuckling pirates. So in the film Quinn’s captain was renamed Chavez and Coburn’s first-mate was renamed Zac. 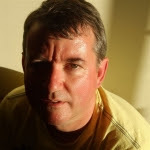 Apparently Quinn, who had clout with the studio and so was listened to, was intelligent enough to agree with Mackendrick that the story had to be made much darker and much closer to novel. The script was duly rewritten, re-instating much of the material that had been kept out of the earlier Disney-fied script. Even so, the film version of A High Wind in Jamaica was much softer and less savage than the novel. It virtually became the story of a gentle pirate captain and Emily, a nice little girl (played by Deborah Baxter) who happens to make one crucial mistake. The film fades out on an appallingly sentimental ballad and is at best the ghost of whatever the novel had to offer. This was what I saw when I was a teenager, making a re-acquaintance with it recently via the clips that are available on Youtube. For purely gossipy reasons, you might be interested to know that the novelist Kingsley Amis’s son, the then-15-year-old future novelist Martin Amis, had a bit part in the film as the eldest of the Bas-Thornton children. He mentions this in his autobiography Experience. Dear reader, I wish you to consider a topic which I rarely address on this blog. It is the matter of books as physical objects. I am not a hunter of precious first editions, and I am not rich enough to have such a hobby anyway. I am happy to read good books in cheap and serviceable editions, so long as they have been proof-read properly and are not littered with literals. More than anything, I am interested in the text of the book itself, and not in the finer points of its physical production – although I do appreciate well-manufactured books when I see them. And yet I am fully aware that the physical object with words printed in it does influence the way one responds to the text. I have just been considering Richard Hughes’ masterpiece A High Wind in Jamaica, and as usual, I have illustrated my notice with images of well-preserved dust-jackets from first editions of the novel. But I did not read the novel in these fine editions. First I went to the shelf where my battered, ancient and hitherto unread-by-me ex-library copy of the novel sat between an ex-library copy of some of Walter de la Mare’s short stories and a very, very battered old Penguin copy of Christopher Isherwood’s Mr Norris Changes Trains. I was consciously resurrecting something from the dead of unread books. I lay the book on a dusty desk, and photographed its battered, paint-splashed, dust-jacket-less ex-library cover. How many decades was it since somebody with a paint-stained thumb took if off a shelf? I opened the book, and found inside the front cover the place where an old Auckland Public Libraries pocket (the type that held one of those cards that used to get stamped when books were borrowed) had been ripped out. I was going to read something that had once been read by many borrowers. I went to the title page and noted that this was an English re-print dating from 1947, eighteen years after the novel was first published. That’s 67 years ago. It would, I guess, have been withdrawn from the shelves after about ten years hard use, so this copy went out of circulation over half a century ago. Then I went to some of the inside pages, foxed and the worse for wear, with one of them bearing what looked like the stain of a long-ago spilt drink. 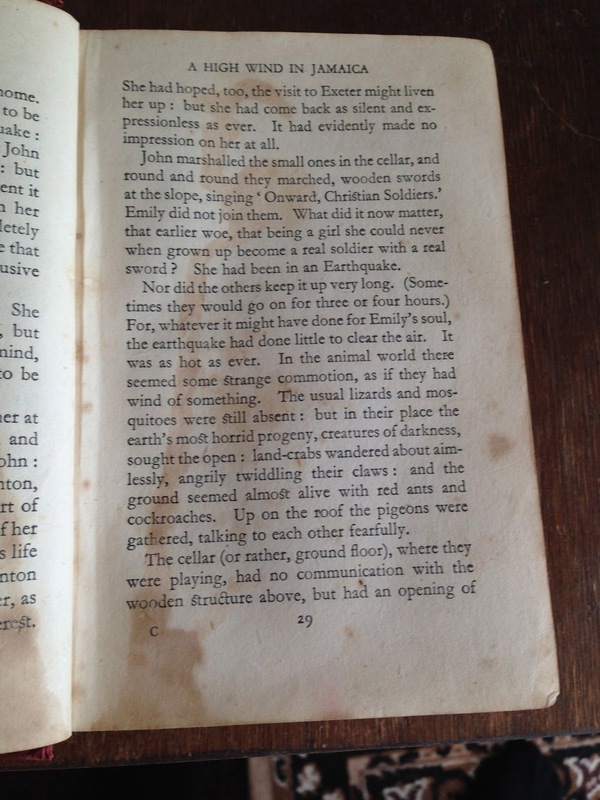 Was some reader in, say, 1957, so excited by the novel that she spilt a drink over the page? Or did the cup fall from her hand as she nodded off to sleep? And you see, all these thoughts buzzed through my head before I settled down and started reading. The physical object in my hands reminded me that this novel was something old and much-read, in a way that a re-print from last year would not have done. I felt a kinship with earlier readers of the book. I felt also an odd sense of virtue in reading the novel in this particular copy. I was putting something old to good use. I was not discarding it because it was old. I reflected that many forests would be saved, and many re-prints rendered unnecessary, if existing old editions of novels were actually used rather than being tossed away or burnt. I thought how much the feel and look of books do influence our appreciation of them. Most people understand this instinctively. A few years back, wiseacres were saying that Kindle and other such apps would render the printed book obsolete. The attraction of holding a whole library in something little bigger than a modest magazine was a very powerful one. And yet, within the last few years we have heard of a reaction against Kindle and its ilk. “Peak penetration” seemed to have been reached, and readers are going back to books in printed form. Back, in other words, to real books with their feel and weight and texture and – if they are old – evidences of previous use. “Every man thinks meanly of himself for not having been a soldier, or not having been at sea,” Samuel Johnson remarked famously about 250 years ago. The remark has been rebutted or deplored numerous times by those who wish to emphasise the ways of peace, and those who regard dreams of soldiership as a sign of barbarism. Nevertheless, I think Dr Johnson was onto something. There is, somewhere in the psyche of most males, a respect for warriors and a vague dream of being a soldier, even if it goes no deeper than memories of childhood games about leading the charge or capturing the pillbox single-handedly. And New Zealand, for all its social liberalism, is one of the countries where the dream most persists, especially as for New Zealanders, wars are adventures that take place overseas. In New Zealand itself there has been no war, in any real sense of the word, for about 150 years. Given that Anzac Day is our most respected holiday, given that the All Blacks are national heroes for playing a game that is ritualised warfare, given that memorials to war-dead appear prominently in every New Zealand town and city, it is harder to get away from martial imagery in New Zealand than it is to get away from the sea. I’m reviewing a very good anthology, The Penguin Book of New Zealand War Writing, and I have taken over a month picking my way through it and considering it. That’s because all the time I’m measuring it against my own knowledge of wars in which New Zealanders have been involved, and of people I know who have been to war or have at least been in the forces. I am a most unwarlike person – bespectacled, over-weight, addicted to sedentary pleasures and to reading far too many books. Not soldier material and over-age anyway. The family I come from is not notably martial either. But my father was in uniform in the Second World War, like thousands of other New Zealand conscripts; one of my elder brothers did a 20-year hitch in the RNZAF, and another was a career soldier who became part of the top brass [see the posting Goodbye Soldier]. As I said, it’s hard to get away from this military stuff in New Zealand, even if the only shot I ever fired was when I was a teenager and my soldier brother took it into his head, one afternoon, to teach me to shoot. One fierce recoil of his rifle, bruising my shoulder, was enough to persuade him of my incompetence and to abandon his lesson. Like most New Zealand males, then, I am no soldier, but I am still very interested in the stuff soldiers do. 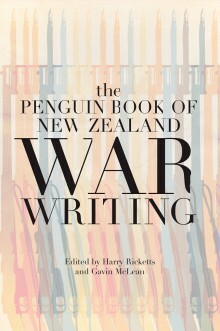 The Penguin Book of New Zealand War Writing was edited by Gavin McLean, senior historian at the Ministry of Culture and Heritage, and Harry Ricketts, Professor of English, poet and editor (whose father was, I believe, a career soldier). In his introduction, Harry Ricketts quite rightly points out the persistence of the myth of the New Zealand soldier as a laconic, modest, resourceful, practical joker. Ricketts notes that, before the great OE became possible for most people, being a New Zealand soldier, engaged in foreign wars, always had an element of tourism attached to it. He is sceptical of the “chauvinistic” (p.10) glorification of Kiwi nationalism expressed in Maurice Shadbolt’s play Once on Chunuk Bair. But he does endorse the more temperate version of Kiwi nationalism, which Ormond Burton attached to Gallipoli. In short, Ricketts establishes quickly both his respect for soldiers and his distaste for exaggerated versions of their exploits. 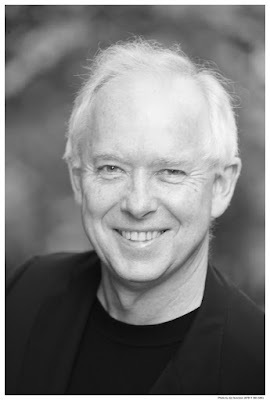 Regarding the editorial process, Rickett’s introduction tells us “ ‘Material of sufficient quality’ has throughout been the guiding principle for our selection (though personal taste and ignorance inevitably play their part.” This, he declares, means the book is an anthology of “ ‘war writing’ and the emphasis is quite as much on ‘writing’ as on ‘war’ ”. (p.13) In prose, poetry, playscript and news story, as much space is given to the home-front reflections of non-combatants and to general reactions to war as to combat zone reportage and fictions. Sensibly, the anthology runs chronologically, not according to when things were written but according to which wars and conflicts the writing references. Contemporary reports rub shoulders with much later fictional or historical accounts of the same events. Doubtless there were many armed conflicts in New Zealand before Pakeha touched the country, but there was nobody to write anything down about them. Therefore, stretching the meaning of “war” somewhat, the first selections in The Penguin Book of New Zealand War Writing are three separate versions of Abel Tasman’s lethal encounter with Maori in 1642 and James Cook’s ditto in 1769. Nearly 500 big pages later, and before a closing section of general “Reflections” on war, the last conflicts referenced are in Iraq and Afghanistan, with a selection from Marianne Elliott’s Zen Under Fire [see posting thereupon]. Between lie sections on nineteenth century wars between Maori and Pakeha; “imperial” wars, meaning the Boer War and the First World War (subdivided into Home Front, Gallipoli and Western Front); the Second World War (subdivided many ways); and “The Cold War and After” – meaning Korea, Vietnam and Iraq and Afghanistan. Some of the selections are familiar acquaintances – they are the type of thing that could not decently be left out of an anthology like this. Thus, from the First World War, Archibald Baxter’s wrenching account of “Field Punishment Number One” from his pacifist classic We Will Not Cease, and a generous selection from Robyn Hyde’s first “Starkie” book Passport to Hell and that delightful passage about rats gnawing corpses from John A. Lee’s Civilian Into Soldier. Or from the Second World War, Jim Henderson’s account, from Gunner Inglorious, of being treated surprisingly well by German doctors and medics after he was shot up; and a selection from Dan Davin’s rather chaotic novel For the Rest of Our Lives; and John Mulgan describing German reprisals against Greek partisans in Report on Experience. 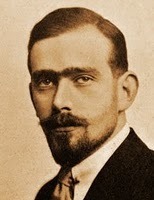 A generous slice of Vincent O’Sullivan’s Shuriken is reproduced, as well as Rowley Habib’s tough, coarse and effective poem on the Maori Battalion “The Raw Men”, and (pre-Second World War) dispatches from Robin Hyde in war-torn China and Geoffrey Cox at the siege of Madrid in the Spanish Civil War. There are some selections that might be said to reinforce the received view of the New Zealand soldier, such a Jock Phillips’ account, from A Man’s Country, of Kiwi soldiers in the Boer War building their own legend of hardiness and refusing to be subservient to those snooty Pommy officers. There are others which are purely heroic in tone. In the whole anthology, the selection which reports heroics most admiringly and uncritically must be Alan Mitchell’s (1945) account of 23-year-old James Ward winning his VC by crawling out on the wing of a bomber in flight to put out a dangerous fire. If there are many things that are familiar here, there are also more obscure things that the anthologists have done well to resurrect – among the best, Donald Lea’s First World War squib “Gold Stripe”, which as poetry might be dated barrack-room stuff, but which is much more honest about the nagging pettiness of a soldier’s life than later and more stridently “anti-war” poetry ever was. Another “find” is Alice Webb’s short-story “The Patriot” (written in 1925), with its vivid account of a young man setting off for war with naïve enthusiasm. By contrast, Ormond’s account gives us [in Ormond’s words] “Scorching heat, swarms of venomous flies, hosts of never-ending lice, thirst, the pervading stench of the unburied dead, and then a new experience – the frightful monotony of war. A dangerous life is not necessarily an exciting one.” An unheroic, matter-of-fact endurance rather than a nationalistic hurrah. I assume this is enough to convince you that this is a capacious and worthwhile anthology. But you see what I am doing, don’t you? I’m now telling what I would have chosen if I had been the anthologist. Not a very nice game. 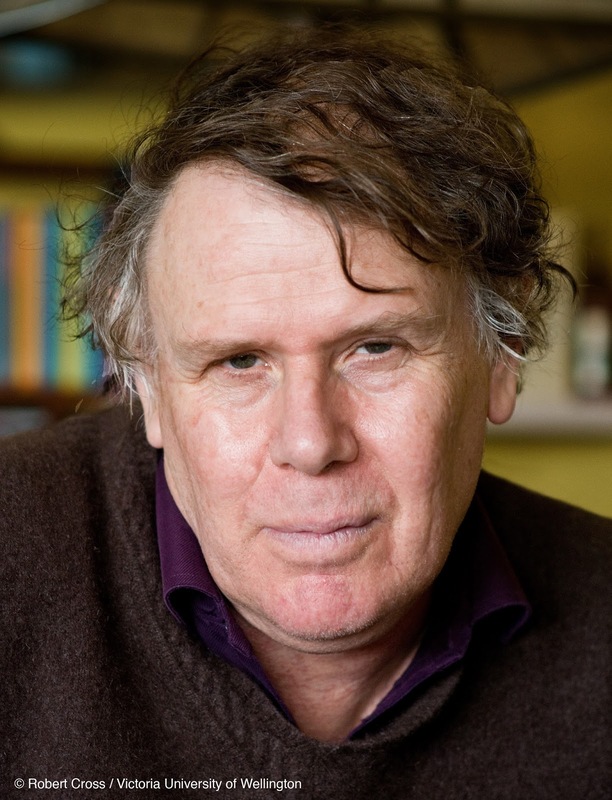 A few years back, when a large but very imperfect anthology of New Zealand writing was produced, many reviewers chipped in to point out all the writers who should have been included. One of the anthologists retorted that they were producing an anthology, not a telephone directory. A fair enough retort I suppose, even if defensive. So I will desist with my niggles at this point and reaffirm that The Penguin Book of New Zealand War Writing delivers the promised goods.